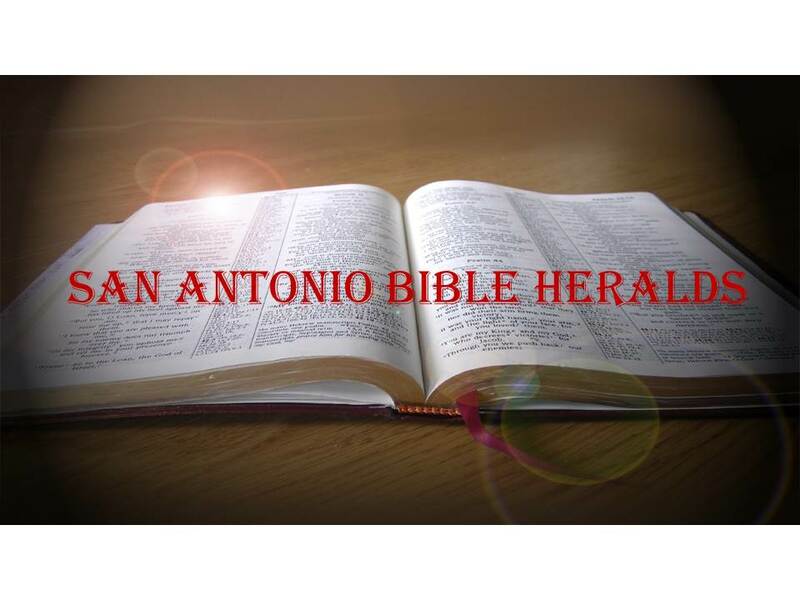 San Antonio Bible Heralds: Do Your Best and Forget the Rest? Do Your Best and Forget the Rest? One the many fond memories I have of my time growing up, is the fact that my parents were always willing to support me in my many activities. When I played baseball, they were there offering their support and encouragement. And when I began to exercise with weights in my mid-teens, my dad was willing to get out of his nice, warm bed at 5AM to help me with my workouts. To this day I remember going into his bedroom to wake him up so he could assist me. He did so with nary a complaint, a lesson that I should have learned much better than I did in my own parental life. Right about now you’re probably wondering what in the world any of this has anything to do with the Bible and Christianity. I’m getting there, but let me also say that life is one big pot full of experiences and events that mold us and that, even when we’re not paying attention, teaches us many things. Some very useful and necessary, others not so much. And therein lies the connection with Christ and the Bible. 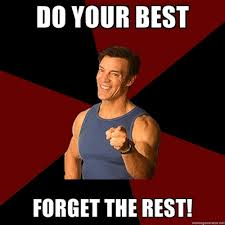 No doubt you have heard many people say something similar to Tony Horton’s dictum: “just do you best and God will cover the rest” or something along those lines. After all, we’ve all read the scriptures that say something similar such as “do your best as your Father in heaven is always doing His best.” Or how about “for if you do your best, you will never fall.” And finally, “the fruit of the Spirit is love, joy, peace and doing your best.” If you’re scratching your head trying to figure out where in the world the Bible says any such thing, you’re not alone. The Bible doesn’t say anything about doing our best. Now, don’t get me wrong. I think that trying to do your best is always a good policy in any worthwhile endeavor. But the problem comes when you’re trying to define just what doing your best is all about. Are you sure that you’re giving 100% all the time? That is, after all, the definition of the “best.” If you exert 99% percent effort, that’s not technically doing your best. And therein lies the big difficulty. Can we truly say that we have done our best? And even more importantly, is that what God is asking of us? To get back to the scriptures I, sort of, cited above, they actually read, “be perfect even as your Father in heaven is perfect” (Matthew 5:48), “for if you do these things (as described in verses 5-7) you shall never fall” (2 Peter 1:10) and finally, “the fruit of the Spirit is love, joy, peace, gentleness, faithfulness, goodness, patience” (Galatians 5:23). What each of these scriptures has in common is the fact that they all ask the Christian to do something specific. Be perfect, cultivate the fruits of the Spirit, and add to your faith a number of virtues. None of them give some vague notion of “doing our best,” but rather, they instruct the Christian about what obedience and life in Christ are all about. There are things we hear so often that we do not give them a second thought. “Doing our best” is one of those things. It is important for us to recognize that, regardless of how much we do, we will always need 100% of God’s grace. 1 John 1 speaks about those who walk in the light, but walking in the light is not, in itself, what a person does. It is who the person is following and who’s light is shining on his life. In verse five John speaks about God being light, and then goes on to speak of those who walk in that light. Will walking in the light result in works of righteousness? Absolutely. We simply need to understand that our works of righteousness are not done in order to be in the light, but because we are in the light. If we understand that difference, then we’ll understand the freedom that comes from knowing that we are children of God and that we do not need to fret about “how much” we are doing. In the fifth century, a man named Pelagius came up with the idea that maybe we humans are capable of living a righteous life without God’s grace. His ideas precipitated many of the theological battles that Augustine waged during his lifetime. Augustine understood that, regardless of how much we do, it will never be enough. But when we understand that it is all of God and none of us (Philippians 2:13), our doing will come naturally and will be designed solely for the sake of glorifying God. As a matter of fact, we will be anxious to do for our Heavenly Father because of what He has and continues to do for us. And there’s no greater feeling than working for the One we Love! Mike, thanks as always for the great encouragement! And you for your support. Always enjoy speaking with you. You are indeed a boost to my spiritual walk.